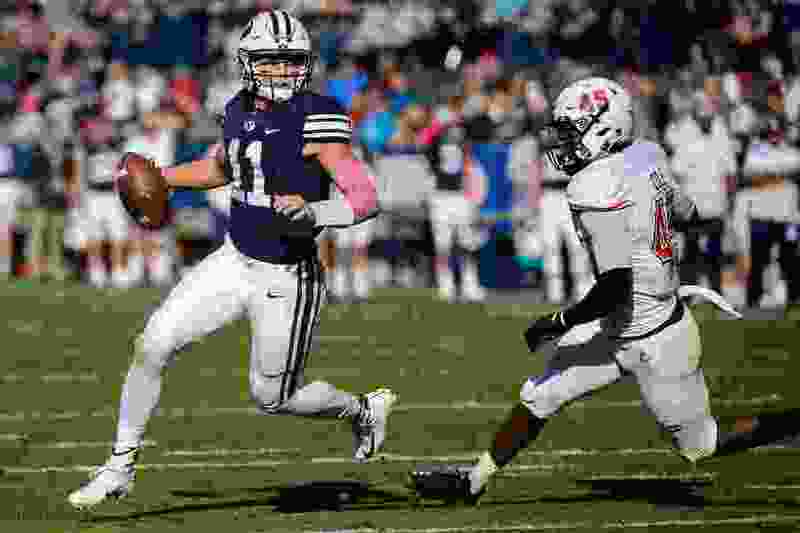 (Trent Nelson | The Salt Lake Tribune) Brigham Young Cougars quarterback Zach Wilson (11) runs the ball as BYU hosts Northern Illinois, NCAA football in Provo, Saturday Oct. 27, 2018. Provo • Kalani Sitake isn’t a worrier. It’s just not in the BYU football coach’s nature. When his head hits the pillow at night, he falls asleep almost immediately, he has often told reporters. Regarding the future of the BYU football program, Sitake also has a calm, peaceful feeling. He likes the direction the Cougars are heading, he said last week in answering a series of questions from The Salt Lake Tribune via email. Highlighted by the emergence of freshman quarterback Zach Wilson, BYU played 28 freshmen last year, including 18 true freshmen. No fewer than 14 different first-year players started at least one game and the freshman class recorded 75 starts. With the exception of tight end Dallin Holker, who will depart on a church mission, all those freshmen will return in 2019 hoping to make even bigger contributions. Offensively, Wilson — who was 18 for 18 for 317 yards and four touchdowns in the bowl win over Western Michigan — leads a talented group of returnees that also includes sophomore running back Lopini Katoa (76 carries, 423 yards), junior tight end Matt Bushman (29 catches, 511 yards), junior receiver Aleva Hifo (28 catches, 358 yards) and steady receivers Talon Shumway, Neil Pau’u, Micah Simon and Gunner Romney. Four of the Cougars’ five starting offensive linemen — sophomore Brady Christensen, sophomore Keanu Saleapaga, sophomore James Empey and senior Tristen Hoge — also return. The Cougars begin spring practices March 4. “I am really excited for spring ball after we are done recruiting,” Sitake said. The fourth-year coach and his staff — sans offensive line coach Ryan Pugh, who left to take the offensive coordinator position at Troy — have been hitting the recruiting trail hard the past few weeks in preparation for national signing day Feb. 6. BYU signed 14 players last month during the early signing period that commenced Dec. 19, the bulk of its 2019 signing class, but is “looking to add a few more in February,” Sitake said. The Cougars recently got commitments from Cade Albright, a defensive end from San Juan Capistrano, Calif., and Trey Andersen, a tight end from Lehi. Albright led Orange County in sacks with 19 and also had offers from UCLA, Utah State and Utah. Andersen, 6-foot-6, had 487 receiving yards for the Pioneers last fall and is expected to go on a church mission before enrolling. Sitake shies away from discussing specific position needs, but BYU obviously needs more depth at running back because Squally Canada and Matt Hadley exhausted their eligibility and Riley Burt announced he is transferring. The 2019 Cougars could also use some help at receiver. Sitake said he’s in the middle of recruiting now and not in a big hurry to replace Pugh, who received a “wonderful opportunity” to become one of the youngest OC’s in major college football.